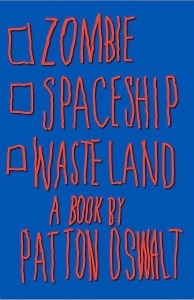 Are you a Zombie, a Spaceship, or a Wasteland? That’s the central question posed in the titular chapter of stand up comedian Patton Oswalt’s memoir/comedic short story hybrid. Are you the type of person who shuffles through life, clinging to the hierarchies and archetypes already laid out on the planet? If yes, you’re a Zombie. Are you the type who wants to escape it all and avoid the nuances and dilemmas of human social interaction? Sure you are, you Spaceship. Or are you the type of person who’s always ready to move on; the type who relishes the thought of the post-apocalyptic world and the changes it will bring? You, sir or madam, join Patton as a Wasteland. Patton Oswalt made his career on being a lot of things most stand up comics aren’t. He’s unabashedly a dork. He’s unafraid to venture into comedic territory that some people may not get. Don’t get the humor in his use of a phrase like “lead marauder”? Tough nuts. Oswalt plays for a specific set of comedy fans and, over the years, they’ve never left his side. His jokes about cult culture have, in some ways, fostered a cult culture around him. With the release of Zombie Spaceship Wasteland, he further proves that few can match his wit and even fewer can escape his vast cultural eye (of Sauron). Zombie Spaceship Wasteland is a lot of things. It’s part memoir, retelling the traumas and triumphs of a nerdy kid’s adolescence. It’s part on-the-road tale, highlighting Oswalt’s disastrous and insightful first forays into stand up comedy. And then there are the purely comedic bits peppered throughout the book to add levity to the heaviness of everyday life. The layout of the book is disarming in its complexity, taking you from a nostalgic story of Patton’s teenage years working in a movie theater (complete with scandal, R.E.M. lyrics, and throwing stars) to a bit featuring fake “punch-up notes” for the world’s most pathetically unfunny broad fart comedy, and then moves on to “We’re Playing Snow Fort,” a piece that starts as a declaration to the awesomeness of the snow fort and shifts into the murky territory of a post-swinging 70’s neighborhood where all the parents have been sleeping with each other, and the hat’s about to drop. There’s enough in here to delight the common nerd, too. He covers a lot of ground, from cult cinema to sci-fi and, of course, Dungeons and Dragons. But everything is done with a certain sense of who he is versus who he was. The D&D chapter isn’t (just) about some funny character he created in middle school. It’s about being passionate about something one day and, suddenly, completely disinterested in it the next. He doesn’t just talk about playing Dungeons and Dragons, he talks about why he played it. He talks about why his character was a brooding brute and how that related to his own insecurities. This is not a typical comedian’s memoir. There is no “rise to fame” story in this book. There are no funny anecdotes and behind-the-scenes secrets from the set of King of Queens. This is an entirely original construction. If Patton Oswalt wasn’t a known name, this book would still sell and be meaningful and moving. I can’t imagine an autobiography of Dane Cook having the same effect. Does that sound venomous? Maybe, but there’s a realism to this book that should be defended. Everyone in this book is a little bit funny and extremely sad. Relatives, high school chums, salacious club owners…these are the characters that fill Patton Oswalt’s life. But when we talk “character” we mean in it in the multi-dimensional sense. These people are not one-note actors in the author’s play. They produce wisdom through ignorance, comedy through their tragic lives. This is the stuff real people are made of, and it only helps to boost the realism and joy of this funny, strange little book.